Sub-cellular localization of enzymes involved in fumarate to aspartate conversion pathway. 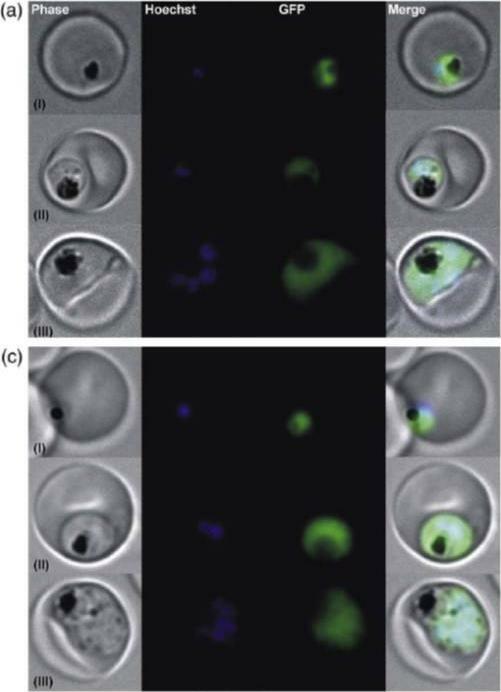 Indirect immunofluorescence analysis of parasitized erythrocytes with anti-PfAAT and anti-PfHsp60 antisera. Anti-mouse and anti-rabbit IgG antibodies conjugated with Alexa-Fluor dyes were used as secondary antibodies. Hoechst was used as the nuclear stain. PfAAT is present in the cytosol. 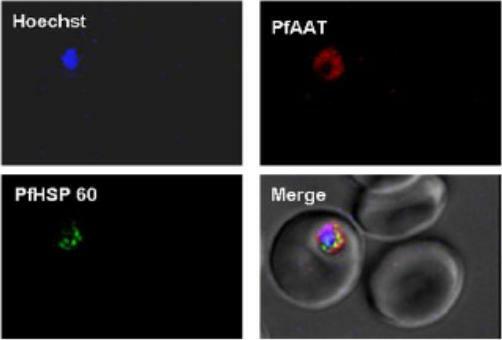 No co localization of PfAAT (red) was found with the mitochondrial marker, PfHSP60.Bulusu V, Jayaraman V, Balaram H. Metabolic fate of fumarate, a side product of purine salvage pathway in the intraerythrocytic stages of Plasmodium falciparum. J Biol Chem. 2011 286(11):9236-45.